Four teams dominate the women's event at the ebt Finals in Stare Jablonki. 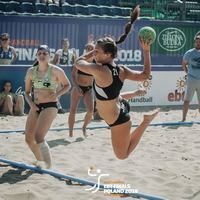 Defending champions Club Balonmano Playa Algeciras and Multichem Szentendrei in group A as well as Westsite Amsterdam and grupo llopis bmp sevilla in group B have not lost a match yet and top their respective group with four wins from as many matches. In the final group matches on Saturday, Algeciras and Szentendre battle it out for the top spot in group A, while Amsterdam and Sevilla fight for the pole position in group B. All matches are streamed live on ehfTV. Competition is also fierce in the men's event where all 12 teams still have the possibility to reach the quarter-finals. It's the first four teams of each group which make it to the knockout phase. After all teams have played four matches, defending men's champions Detono Zagreb top group A with three wins and one defeat – they lost their last group phase match on Friday, 2:1 against Salgótarjáni Strandépítök BHC. The second Croatian team in the competition, Chemo Profili Zagreb, currently occupy first rank in group B. However, with BHC 2areg and Pinturas Andalucia BM Playa Sevilla two more teams also have six points on their account. Just like in the women's event, every team plays one more group phase match before the quarter-finals throw off in the afternoon session. Coinciding with the start of the ebt Finals, the European Handball Federation has launched a new campaign, dubbed #dontworrybeachhappy, which runs from the end of May until the end of August. Weekly prizes include a beach towel, provided by the EHF's sports outfitter Salming. The weekly winners of each month compete for the title of the 'monthly winner', who can look forward to a full 'Salming beach pack', which includes a backpack, shirt, sunglasses, and much more. The monthly winners then have the won the ultimate prize: a trip to the EHF Beach Handball Champions Cup. Make sure you follow them! The first challenge is 'Share your best beach handball selfie' and the entry period runs until 10 June. Don't forget to hashtag your selfie with #dontworrybeachhappy.